From left are Sheriff Kyle Dukes and Council Members Kimberly Cates and Mike Long. WARSAW — County Sheriff Kyle Dukes spoke to the Kosciusko County Council on Thursday night, Feb. 14 and touted his efforts to continue to reduce the county jail’s prison population and also invited county officials to come take a whiff of the place since his tenure began at the first of the year. 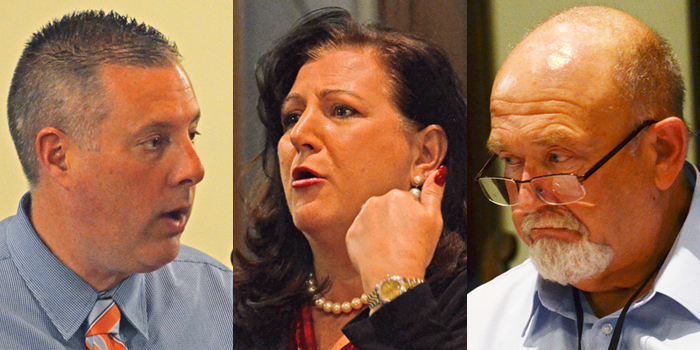 Dukes’ invitation received laughs from the council and the audience, but he clarified by touting the efforts of jail personnel to ramp up housekeeping over the past month and singled out Council Member Joni Truex with his unorthodox invitation. Dukes continued by saying that he and his staff have begun efforts to address jail overcrowding. One of the strategies that Dukes said is working to reduce the jail’s population is to flip flop sentences for inmates who are serving terms with both the Indiana Department of Corrections and the county jail. In reducing the jail population, Dukes said collaboration with other personnel and agencies such as the county’s prosecutor and community corrections officials, as well as looking at each inmate’s individual case, is helping to trim the facility’s number of occupants. In other business, the council heard a report from Jill Boggs of the Kosciusko County Convention & Visitors Bureau. Boggs told the council that her organization had ramped up its marketing budget in an effort to promote the county as a destination. She said traffic on her website spiked in 2018 from the previous year and that more of her budget had been earmarked for marketing efforts. “In total sessions to our website, we had 56,000 new unique visitors to our website through our marketing efforts,” Boggs said. The council also heard a report from County Highway Superintendent Scott Tilden about the need for a new snow plow dump truck. Tilden said the county’s insurance company listed a truck recently involved in a rollover accident as a total loss. He said he planned to keep the truck for parts and sought permission to try to buy a new vehicle. The council approved the request.